In honor of Top Chef Duels, airing on Bravo at 10 ET tonight, we’re taking on some food duels of our own. This week on Top Chef Duels, two of our all-time favorite chefs are squaring off: former show champions Kristen Kish and Stephanie Izard. They’ll be challenged to make an upscale pasta, which got us thinking about the noodles in our lives. From the time you can chew, these comfort classics become part of many American lives. We’re talking, of course, about macaroni and cheese and spaghetti and meatballs. FWx’s Noah Kaufman is in the cheese corner while Justine Sterling takes the Italian American standard. NK: Presumably there is a dictionary entry on the ’90s, and if you look at that entry you will almost certainly see a picture of Cheesasaurus Rex, the surfing cartoon dinosaur mascot on most boxes of Kraft mac and cheese from that decade. Even if you weren’t a child of the ’90s, I’d bet a large sum of money that for 8-year-old you, mac and cheese was one of only three foods you would eat. 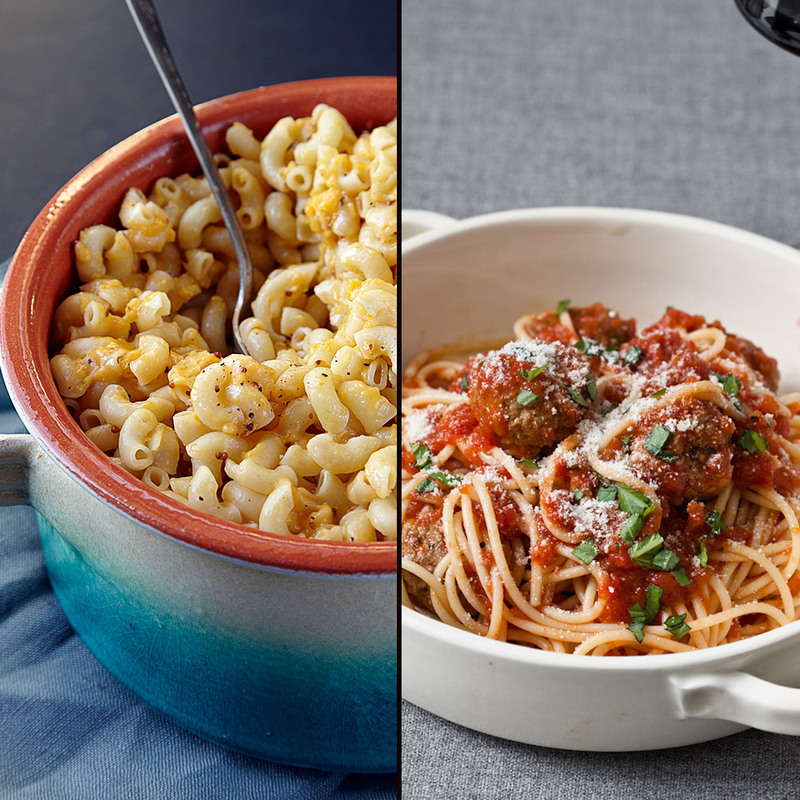 JS: Mac and cheese may make you nostalgic for drunken late night munchies in college or hastily microwaved dinners when the 16-year-old babysitter was in charge of dinner, but spaghetti and meatballs brings you back to a family dinner at a dining room table complete with checkered tablecloth. Or maybe it brings you back to the first time you watched Lady and the Tramp and realized what love was. Either way, it’s better than those neon orange mac and cheese memories. NK: It comes in boxes that say instant. In fact there is an entire grocery aisle devoted to boxes of macaroni and cheese that say instant. It doesn’t get easier than that. But let’s assume you’re talking about the real thing. A normal, stocked kitchen will have all of the ingredients you need to make mac and cheese (if you’re not keeping at least four cups of cheese in your kitchen at all times, I feel bad for you). The actual cooking is a snap. Can you boil pasta? Can you melt cheese? Congratulations, you can make macaroni and cheese. Yes, it might be better if you took the time to make a nice béchamel first, but that’s the great thing about mac and cheese: There’s a version for every skill level, even the “It’s 1 a.m., boy, am I drunk and I’m out of Trader Joe’s frozen empanadas” skill level. Those are not circumstances under which you want to be rolling balls of meat. JS: If we’re talking microwaveable mac and cheese or boxed mac and cheese versus spaghetti and meatballs, then yes, mac and cheese is easier. But if you’re doing mac and cheese right then you’re making a cheese sauce—and that’s not as simple as you think. It’s certainly not as simple as chopping up a few things, mixing them with meat and rolling out balls. Get the kids in on the fun! Then it’s not just dinner, it’s a family memory. Awwwww. NK: I think we’ve established that there is a version of mac and cheese no matter how proficient you are in the kitchen. There’s also a version no matter your budget. A few easy additions to get you started: shave some truffles into the sauce, mix in some prosciutto before you put it in the oven, use that kale you bought at the farmers’ market because you started dating a “kale sort of person.” Why not go nuts and ditch the cheddar for some $2,000 a pound donkey cheese? The great thing about mac and cheese is that it can be as blank a slate as you want it to be. You can go out and blow your weekly paycheck on almost any high-priced ingredient and convince whoever you’re eating with that you’re a genius. JS: Is Mr. Mac ’n’ Cheese up there talking about truffles? I bet he is. Snore. Fancy spaghetti and meatballs doesn’t rely on tried gimmicks like truffle oil. Instead, the upgraded version of the classic dish calls for a meat makeover like Wagyu beef or local duck or venison. Or, try just making one huge meatball. Or, screw it, don’t change anything about the dish. It’s fancy enough as is. Just add some candles and a single red rose and you’ve got one fancy time ahead of you. I call that Lady and the Tramp-ing. NK: You can dress it up with vegetables and get your daily dose of every vitamin known to humanity. Throw some whole-wheat pasta in there while you’re at it. As long as you’ve got some sharp cheese melted on top you’ll never even know there’s anything healthy in there at all. JS: Swap in some whole-wheat spaghetti and roll up some turkey or vegetarian meatballs and blammo, you’re eating healthy and homey. NK: If you’re a responsible macaroni and cheese eater you will have taken care of the crusty top on the first night of eating and that’s the only part that won’t reheat into a melty, delicious mess. And if you happen to be one of those people who believes using a microwave even once will give you cancer, you can always waffle your leftovers. JS: It’s…fine. Look, old spaghetti is not the greatest meal in the world. It turns gummy and sticky and chewy. I’m not going to try to lie to you and say that’s just part of its charm. But the meatballs? They’ll hold up. The best thing about day-old spaghetti and meatballs is that it can magically turn into an incredible meatball sub. Just toss the pasta and roll those beautiful, meaty babies onto some crusty bread. What can you do with leftover mac and cheese? Oh, I know. Throw it away and make some spaghetti and meatballs like you should have in the first place.